I love this time of year when we reflect on the many things we are grateful for in our lives. The last couple of years, I wanted to teach my 3-year-old Kaye to express gratitude for the many blessings in her life. Thus began the tradition of our Thanksgiving countdown. A little tradition that began with construction paper chain links a few years ago. The main idea: Write down one thing we are grateful for each day in November. Each member in the family participate in writing down things they count as blessings. Then we display it somewhere visible as a daily reminder of the things appreciate in our blessed lives. This year, I upgraded the construction paper chain links to a leafy garland. 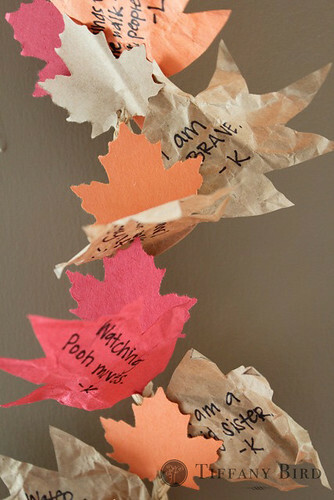 Here is a simple tutorial for you to count your blessings in November with a garland. If you make something using this tutorial, please upload pictures of it in our Flickr group to show it off to everyone. You may be featured on Simply Modern Mom. 1. 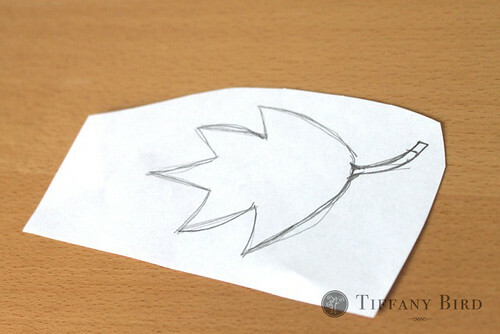 Draw your leaf pattern. If you need inspiration, collect some fallen leaves outside then trace. You will want to make the stem about 1″ long. Then cut out the pattern. 2. 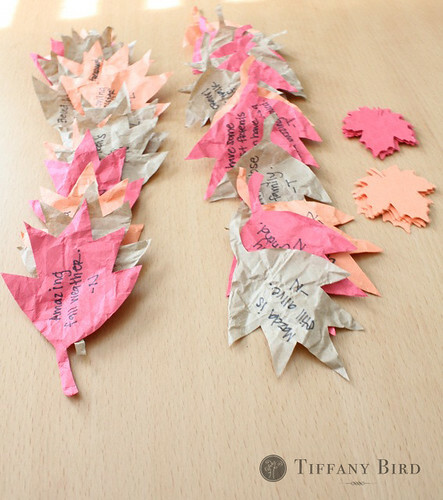 Trace the leaf pattern on various different types of paper. Trace 30 leaves for each day in November. 4. 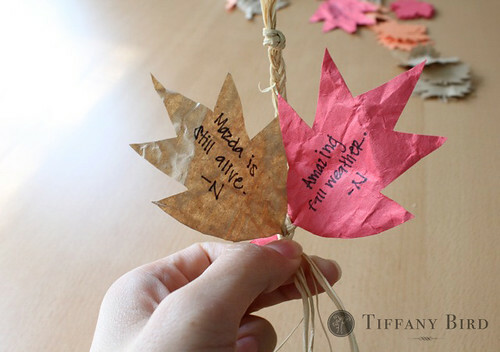 Give each family members a few leaves and have them write their blessings. 5. This is an optional step, but it makes the garland look fuller. Cut out smaller size leaves to put in between the large leaves. Luckily, I had a large leaf punch. 6. 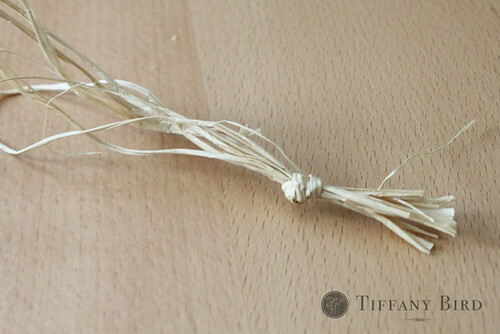 Gather about 6 or 9 strands of raffia then tie a knot on one end. 7. Begin braiding. 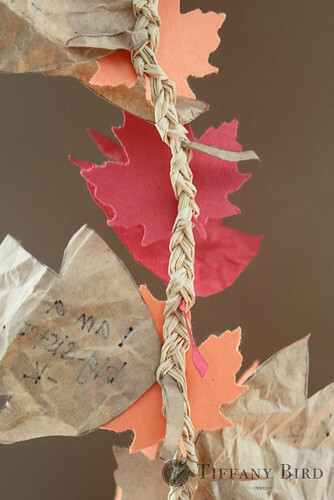 Braid about 3-4″ before adding leaves into your braid, sticking the stem of the leaf into your braid. 8. If you are using the small leaves for a fuller garland, insert the small ones into some of the braids between the larger leaves. Keep going until all the leaves are gone or you have reached your desired length. Make sure to do 3-4″ of plain braids before ending the raffia with a knot. If you need a longer length, add more raffia into the braid. A back and finished view of the garland. 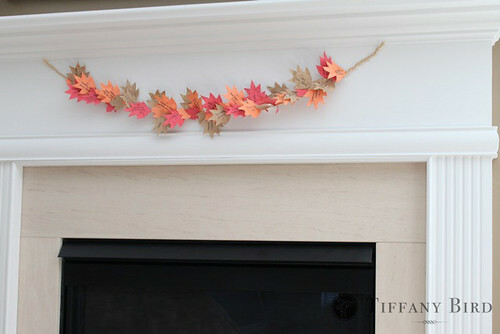 If you make this garland this Thanksgiving, please leave a link to a picture of it so I can check it out! This is a fab idea and looks so chic too! Thanks! And the idea just came that you can tie both ends together to make a wreath. so cute! very creative, and a wonderful keepsake! Thanks for sharing! That really looks great. I love that you write on it actual things you are grateful for. And the end result looks so attractive. thanks for this simple & easy project! you are so creative! Great idea, what a great thing to remind everyone that no matter what we have a lot to be thankful for. I love this idea, so great! Such a lovely, LOVELY and charming garland!! It’s so delicate looking too. What a great idea. Simple and thoughtful. Very cute and frugal! LOVE it. What a fun and good lesson for kids! Plus it looks gorgeous too. What a great idea! Very cute and so important to put those thoughts down on paper! I really like the look of this – and you can save it and add on to it every year. What a wonderful idea. 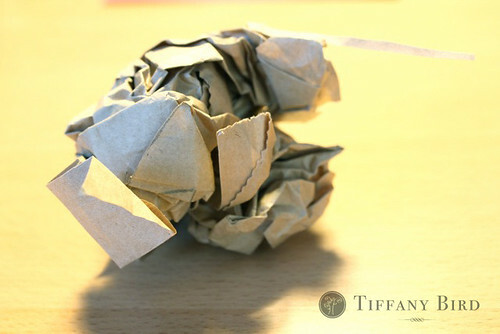 I especially like the way you crumpled-up the paper and had family members write their own notes. What a lovely idea. Lovely! I’m bookmarking this idea~thank you for sharing! I love this! Thanks for linking it to my blog! This is darling–Great job–I have a party every week- Its So Very Creative (mondays)–would love to have you be an inspiration to other gals. 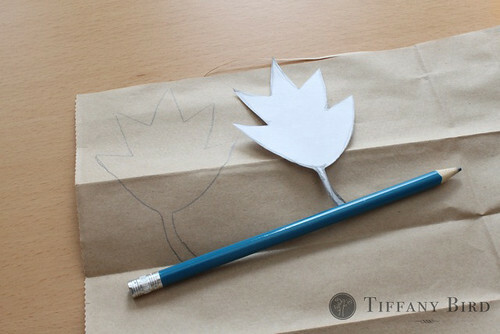 You are so creative Tiffany! wow. .beautiful! I am doing a post on intentional gratitude and making a list of all the things we are thankful for. . I have linked to this post and put a picture of your garland on my blog. . thanks for letting me share your inspiration with me readers. Thanks for linking to me! If you make a garland, post a picture and link to it so I can see, too! Just wanted to let you know I will be linking to this post in my newsletter that is coming out the 8th! You are being given full credit and a link back to your website.